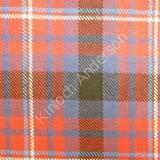 The tartan associated with Russell causes a great deal of confusion, being known by four different names: Russell, Mitchell, Hunter and Galbraith. The name Russell comes from the Old French ‘rous-el’, a diminutive of ‘rous’ meaning red coloured. As a name it would have described an individual as having red hair or a reddish complexion. It may be compared with the Scots ‘reid’ and the Gaelic ‘dearg’. Hugh Rozel or Russell is supposed to have been the first of the name to have come to Britain at the time of the Norman Conquest. He settled in Dorset, and a descendant of his accompanied Edward III at the Battle of Halidon Hill in 1333, and afterwards settled in Scotland, being designated Russell of that Ilk. Later descendants of this family purchased lands in Aberdeenshire and Banffshire. However, the first record of the name in Scotland is nearly 200 years earlier, c.1164-77; Walter Russell witnessed a charter to the Abbey of Paisley. Allowing for the etymology of the name, there must have been a number of individuals bearing this name who had no family connections and there were undoubtedly a number of separate Scottish families of this name spread over much of the country and who were in no way related. It has been claimed that the Russells were followers of the Cummings and as such might also claim their tartans, however apart from a slight topographical association in Aberdeenshire, there appears to be no evidence to support this claim.